“The telecommunications market is changing rapidly; 5G is on the way, and new antennas are required to provide increased data capacity while meeting new stringent environmental standards and legislation” says Fergal Lawlor. “We need our R&D team to consistently come up with innovative new products so we can stay relevant.” Lawlor is CEO of Alpha Wireless, an antenna manufacturer headquartered in Portlaoise. 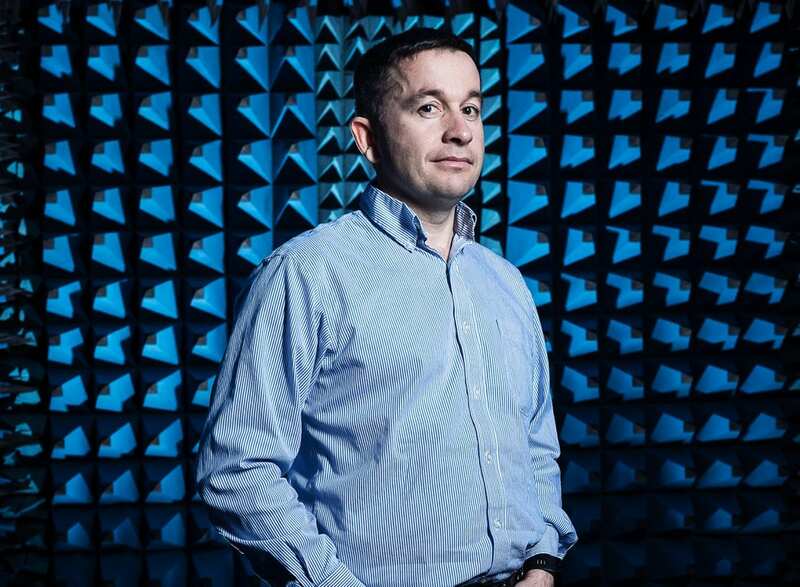 Alpha Wireless, a recipient of RD&I funding and Business Innovation Initiative funding from Enterprise Ireland, develops and supplies a range of antennas that allow phone masts to communicate with devices such as smartphones. The company is export-focused; approximately 90–95 percent of its sales are in overseas markets, with North America and Israel among the biggest. A recent round of funding from Enterprise Ireland, however, saw the company develop a product specifically to suit the needs of a market a little closer to home – the UK. Throughout towns and cities, antennas for telecommunications are now being integrated with street infrastructure, rather than mounted on large masts. This is driven by environmental aesthetics, and is rigorously policed by national planning authorities. Alpha Wireless worked closely with its customers in the UK to design a new product tailored to follow the UK’s specific regulations. Enterprise Ireland’s Business Innovation Initiative funding was key to this effort. Enterprise Ireland’s Business Innovation Initiative funding allowed Alpha Wireless to respond to an emerging market need, initially for the UK market, but with the potential to expand to other international markets. RD&I funding helped the company to develop a new type of combined antenna solution. The new product allowed the company to increase sales, exports and number of employees. Many of the challenges were not just specific to the UK market. The combination of the industry panel and a dedicated on-site R&D department helped the company to tailor its solution and break into the market. They needed to integrate multiple antennas into a cylindrical tube that sits on top of a street pole. “UK planning permission and zoning requirements meant that we had only a 330mm-diameter tube for all the required antennas,” explains Lawlor. The challenge was to get the antenna’s multi-band functionality into that space. The Alpha Wireless researchers needed to miniaturise the technology but keep as much of its functionality as possible. “It took us six to nine months to design the combined antenna, which was intense in terms of R&D resources. The RD&I funding came in very useful during this period and helped us increase the size of our R&D team,” recalls Lawlor. The result was a complete suite of antennas small enough to be mounted onto a lamppost, providing coverage at street level where it is really needed. The company’s focus on learning the needs of its market, and the resulting innovative technology, has paid dividends. Since applying for the Enterprise Ireland funding in 2015, Alpha Wireless sales in the UK are now in the millions and it has more than doubled its Irish workforce to 120 employees. It’s not resting on these laurels, though; combined antenna solutions have global potential, and Alpha Wireless has begun selling variations elsewhere, including the US, Canada and Greece. Click here to learn more about Enterprise Ireland’s Innovation supports.